Bathtub refinishers Chicago | Bathtub Refinishing Reglazing | Budget Refinishers, Inc.
in the industry and only skilled, trained technicians to get the job done right, the first time! 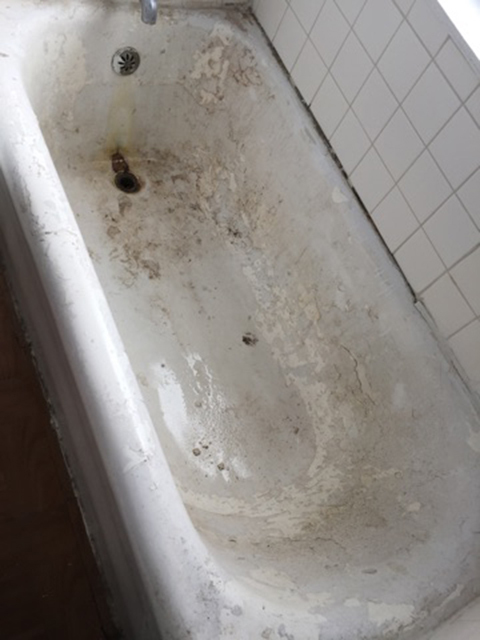 Does your Tub or Tile look like this? Wait! Don't pay to replace! We can fix it! Call us! We can make your old tub & tile look like new again! It's time to enjoy your bath time again. to quickly turn around their apartments." We refinish ALL types of bathtubs including porcelain, claw foot tubs and Jacuzzis. You can choose our high gloss standard white or a variety of custom colors. We refinish ceramic bathroom wall and kitchen countertop tiles. We can provide refinishing services for tiles in apartment complexes, schools, hospitals and hotels. We can refinish all different types of kitchen countertops and bathroom vanities. Obtain a natural looking stone finish with our unique high quality products. Budget Refinishers offers additional services including the refinishing of sinks and shower bases, re-grouting tile and replacing old, rusted overflows and drain covers. The Refinishing Industry started over 25 years ago as a cost effective, time saving alternative to replacement. It’s advantages are obvious. It is also referred to as reglazing, glazing or resurfacing. Why refinishing is better than replacement! Using Budget Refinishers, Inc. will save you unnecessary costs that will allow you to upgrade many other areas in your home. Why wait weeks for the replacement of your old bathtub when you can modernize your bath or kitchen by refinishing it in only a few hours? Get Your Free Estimate Today! Have a bathtub that you aren't sure about or a countertop that you don't want to replace? Tell us about it and we will get back to you with a great low price that will fit your budget.